Alzheimer’s disease, a progressive brain disease that eventually leads to complete memory loss and loss of thinking skills, in people over 65 years, has been so far defied a cure. However, researchers at the National Brain Research Centre (NBRC) are almost nearing success, as their work on mice with Alzheimers disease indicated that Ashwagandha extract can reverse memory loss and could be a promising cure for this disease in humans. The NBRC Neuroscientist, Vijayalakshmi Ravindranath, tested the semi-purified sample of the root of the herb, extracted at Delhi University on genetically modified mice with Alzheimers disease. The study involved two set of mice “a set of middle aged mice and another set of old mice. They were given oral doses of Ashwagandha root extract for 30 days, and monitored. After one month, the scientists noticed a reduction in the amount of amyloid plaques (Beta Amyloid is the main component of amyloid plaques), the deposits usually found in the brains of those with Alzheimers. The animals also showed improvement in cognitive abilities. Initially, the mice with Alzheimers were neither able to learn, nor retain the learning. However, following 20 days of Ashwagandha treatment, there was a difference, and after 30 days, they began to behave normally, Ravindranath said. In fact, Ashwagandha does not work directly on the brain. It improved a protein in the liver, which is thrown out in the blood, and acts like a sponge by pulling out the amyloid from the brain. The Natural Products Laboratory at the Delhi University is continuing to study a series of extractions from the root of the Ashwagandha plant, in their laboratories. Ashwagandha, also known as Winter Cherry, is a herb used in ayurvedic treatments since ancient times, and is considered a wonder herb in Ayurvedic medical system. 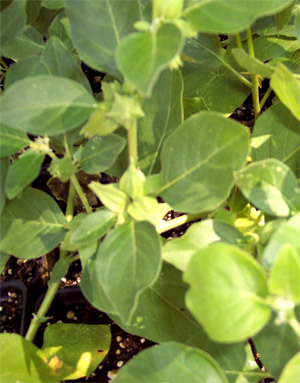 Ashwagandha is specifically used in treating a wide range of conditions including arthritis, respiratory disorders, insomnia, anxiety, inflammation, cough, bronchitis, nervous disorders, gynaecological problems, infertility, impotence, degenerative symptoms, juvenile mal-development and growth, depression, weak digestion, fluid retention caused by low body metabolism, and other immune-compromised diseases.